(CLEVELAND) March 25 — The Brotherhood of Locomotive Engineers and Trainmen (BLET) announced that it strongly opposes S. 650, the Railroad Safety and Positive Train Control Extension Act, which is expected to be voted on in the Senate Committee on Commerce, Science & Transportation today. Positive Train Control (PTC) is a technology that will prevent most train-to-train collisions in the rail industry, and was mandated by the Rail Safety Improvement Act of 2008. The deadline for implementation of PTC technology is December 31, 2015, and when it is completed, the technology will cover nearly 60,000 miles of track. S. 650 proposes extending the deadline for the implementation of PTC from the current deadline to December 31, 2020, with the possibility of an additional two-year extension to 2022. In addition to the blanket extension, the legislation prohibits the Federal Railroad Administration (FRA) from ever requiring railroads other than Class I and passenger/commuter railroads to have PTC if “the railroad does not choose to implement positive train control.” Additionally, it mandates that the FRA must respond to a railroad application for extension within 10 days, which makes it nearly impossible for FRA to perform the sort of analysis required to determine whether the applicant truly cannot comply with the law, and would effectively grant the railroads the requested extension with little or no proof of legitimate need. Secretary of Transportation Anthony Foxx said the Obama administration is opposed to extending the PTC implementation deadline, testifying before the House Transportation and Infrastructure Committee in early February that the U.S. Department of Transportation (DOT) continues to hold the “industry’s feet to the fire in getting PTC done as quickly as possible,” as opposed to allowing a blanket extension. In spite of that, certain railroads have convinced their “friends” in Congress to propose just that. “Not all railroads have treated PTC the same, but contrary to statements made by certain railroads, Positive Train Control is not a new technology,” BLET National President Dennis R. Pierce said. “It has been around in some form for more than 40 years, and has been on the National Transportation Safety Board’s most wanted technology list since 1971. “The bottom line is that the technology saves lives, both in the railroad workplace and with the public in general. On the heels of the horrific railroad accident at Chatsworth, California that claimed 27 lives, Congress mandated in 2008 that PTC technology be implemented by the end of 2015. This latest push by Congress to now allow up to a 7-year delay raises the question of just who Congress works for – their large corporate benefactors or the general public. Those pushing this extension have obviously forgotten the multitude of avoidable railroad tragedies and resulting loss of life much quicker that I will ever be able to,” said President Pierce. “Since 2005, the NTSB has completed 16 investigations of railroad accidents that could have been prevented or mitigated with Positive Train Control,” BLET Vice President & National Legislative Representative John Tolman said. “These 16 accidents claimed 52 lives and injured 942 people; the damages totaled hundreds of millions of dollars; and yet certain railroads have spent the last seven years dragging their feet on the implementation of PTC. “Each death caused by the delay of PTC’s implementation is one too many, and Congress capitulating to the railroads for this broad extension is most certainly not in the public interest,” Tolman said. 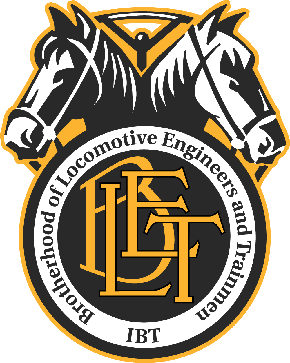 The Brotherhood of Locomotive Engineers and Trainmen represents more than 55,000 professional locomotive engineers and trainmen throughout the United States. The BLET is the founding member of the Rail Conference, International Brotherhood of Teamsters. I took a reading exam to get a job on the UP. berofe. I was kind of shocked at how easy the test was. They want to be able to hire from a large group so they don’t want some damn test thinning the herd down(who needs nerds anyway). Technically, you would think that a system would be in place(like a bell) to notify the engineer that he or she is passing a rail light and they better check what color it is. Head on collisions may be rare but trains running into the back of each other happen some times when a switch hasn’t been thrown back to where it was supposed to be. Since I didn’t get hired I can’t offer much more expertise then that.